Last year I learned how to teach the Heartmath technique – find out more about Heartmath here. Here’s a simple guide to the theory and the practice. It has two axes – the vertical one shows the “autonomic nervous system” – this is the part of the nervous system which is responsible for the survival responses of “Fight of Flight OR Freeze” reactions. The autonomic nervous system is divided into two pathways – sympathetic and parasympathetic. Think of the sympathetic as being like the accelerator – when it is active there is a lot of adrenaline released into your system, your heart beats faster, your breathing is faster, and your body mobilises oxygen and energy to all your muscles ready to help you “fight or flee”. The other path is the parasympathetic and can be thought of as a brake – through activation of the “vagus nerve” it slows down the heart, quietens and closes down your systems – the “freeze” reaction. We frequently oscillate wildly between these two extremes, flying from panic to collapse and back again! The second axis, the horizontal one has one of the body’s main defence hormones at the left – cortisol. This is necessary for normal defence, but in excess cortisol can do a lot of harm. It’s sometimes called the “Stress hormone”. 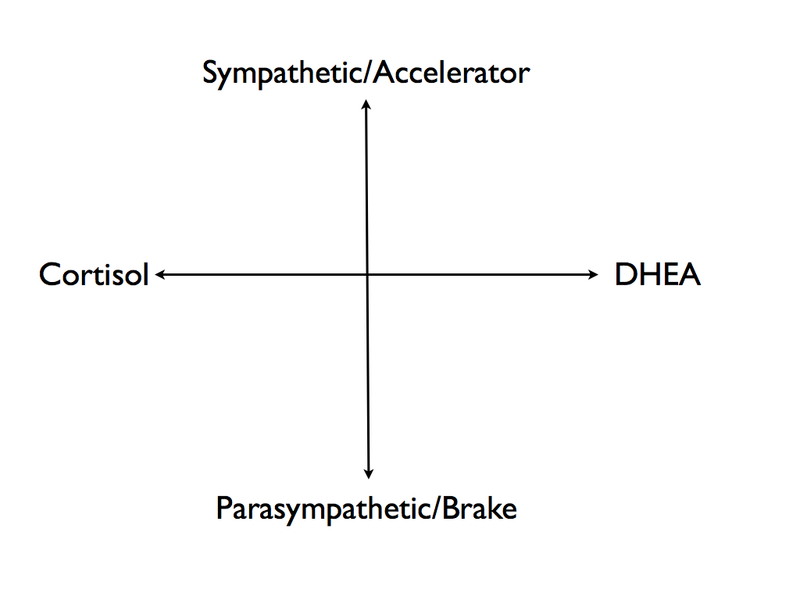 The right hand edge of this axis is “DHEA”, sometimes known as the “vitality hormone” – when there is a lot of this in the body, all the cells age more slowly and growth is stimulated. What we want to achieve is a harmony of these systems – when we are in the top left quadrant our heart rhythm is chaotic. The heart rate varies all the time in a normal heart, but when the “heart rate variability” is chaotic, we’re not in a good place! Interestingly, when we are in the zone on the right of this chart, our heart slips into “coherence” – a kind of overlaid smooth, harmonious rhythm of the heart rate variability. In coherence we have harmony, we reduce the stress hormones and the excess autonomic activity, and we redress the balance between cortisol and DHEA. 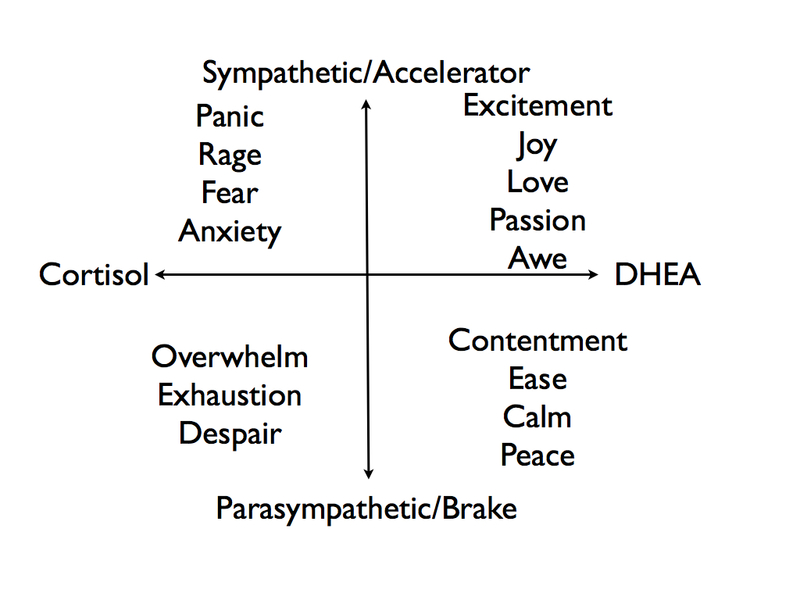 Now here comes the fascinating bit – each of these zones or quadrants is associated with particular emotional states, with particular feelings. The Heartmath technique consists of re-experiencing one of the “positive” emotions on the right of this chart by recalling and reliving an episode or even where we felt such a feeling. There are three steps to achieve “Quick Coherence” – a basic Heartmath technique. Step 1. Heart focus. Bring your attention or your focus to the heart area of your body. Step 2. Heart breathing. Take three, slow, deep, even breaths, filling the heart area of your body with oxygen, then emptying your lungs of all the carbon dioxide. Slowly in, slowly out, for three breaths. Step 3. Heart feeling. Now recall an event where you experienced one of the positive, heart felt emotions. Here’s a couple of ones I use to give you an idea of the kind of event I mean. One is one of my grandchildren running up to me, shouting “grandpa!” and jumping up into my arms. That’s a great one! Another is looking out over Ben Ledi from my living room window when we have one of those gorgeous deep red sunsets – just amazing! Pick one of your own, and recollect it. Stay with that memory until you become aware that you are feeling that feeling again. This is about recreating a feeling. Once you have it, that’s it. You’re there. Congratulations, you just managed “Quick coherence”. Do check out the Heartmath Institute website – lots of great resources there to explore this technique in more detail! I was just this minute preparing a Heartmath slide for my course tomorrow, and clicked on a google image that looked helpful, and was catapulted to this entry on your blog. Really useful to have your explanation written down here as a reminder of what you showed me the other day. Looking forward to showing it to the women tomorrow-a bit of reading around suggests that increased DHEA production may be anti-proliferative for cancer cells-really pleased to see that. Visiting (all the way from Australia ;-)) at Amy’s suggestion. Please forgive a technical request. May I suggest that it would be much easier to read factual information like this if your paras were shorter? What you’d do grammatically and what is easy to read on screen sometimes conflict. And big paras are hard on the eye on screen and it takes a real “choice” to read on when you see them. In this day and age of only a second or two to grab a reader’s attention it might help if your paras were much shorter. Didn’t stop me but I certainly paused (because of the connection with Amy probably). Others may not and would then have missed an excellent article. thanks for that feedback Chris – actually I made the images and uploaded them directly into the blog post on wordpress and had a bit of a wrangle getting the text in the right place at all! Probably something simple you can do that I don’t know!! Anyway, thanks for the feedback on the para length. I had some feedback recently on another post that it was too long over all. Guess there’s something I need to be hearing! Thank you for this handy reminder which I’ve printed and attached to my wall at work. Now, the trick is to use it! Great article. Love how you taken something so complex and made it simple and useable.